Congratulations to the First Class! 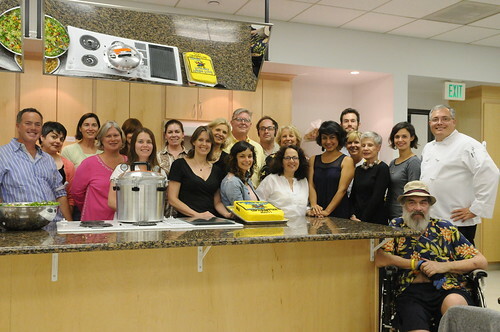 The 2011 Class of Master Food Preservers - first in a decade! Twelve weeks really flies by! A few of us found ourselves twiddling our thumbs last Monday night - the first night in months when we didn't have an MFP class to attend. This first class graduated back on Monday, June 20th, sending 18 (!) brand new Master Food Preservers out into Los Angeles County to teach the public the essentials of safe home food preservation. Our instructor, MFP Ernest Miller wasted NO time in recruiting some volunteers for his new Pickle University at The Farmer's Kitchen in Hollywood and several of us are already partnering with local organizations and markets to fulfill our 30 volunteer hours. But before we get into all that, first a little recap. Graduation was a fun night. We all talked about our plans, what we liked best in the class, and what we wanted more of in the future. We had a GREAT silent auction to raise money for the program. And before we were handed our diplomas, we had a little surprise for our dedicated instructor. As classmate, and now MFP, Alexandra said, what's the point of social media except to embarrass those we love? Ernest Miller, you are awesome. And yes, we'll be teaching the next class. I only hope we're able to do as good a job as he did. We'll be posting dates and locations of where you can find our new MFPs teaching about canning and preserving. In the meantime, if you want/need an MFP at your event, contact Brenda at bkroche@ucdavis.edu. Congratulations!! I'm so looking forward to encountering the MFPs! Thank you everyone for taking this on. Your enthusiastic public audience awaits! We're Here at the Fair-- Where Are You?